Handel was born in Germany but spent much of his life in England. Handel music includes many operas and oratorios, including that most famous of all oratorios, the Messiah. He also wrote the Water Music; the Music for the Royal Fireworks; and works in many other genres. 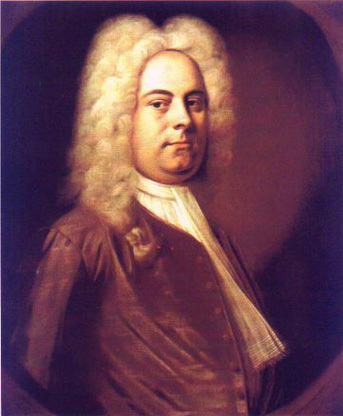 Handel aged approximatedly 42 years old. This oil painting on canvas is entitled Portrait of Georg Friedrich Händel. It is dated c. 1726-28 and is said to have been painted by Balthasar Denner (1685-1749). It is currently located in the National Portrait Gallery, London. Handel at the piano. Date: circa 1720. 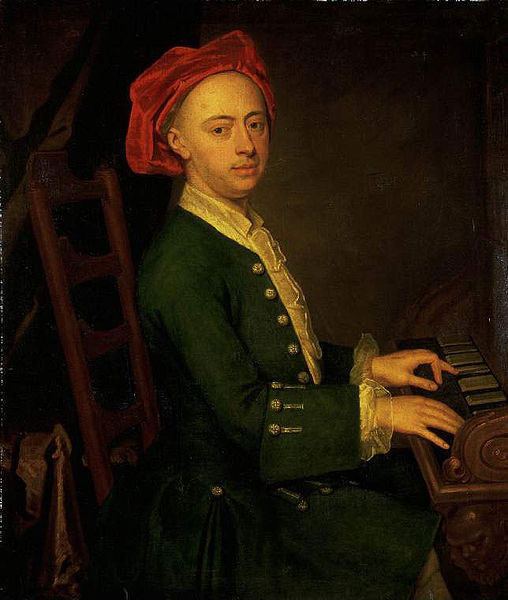 This oil painting on canvas is known as The Chandos Portrait of Georg Friedrich Händel. This painting was formerly attributed to James Thornhill but now authorities are unable to say who the painter was. It is currently located in the Fitzwilliam Museum, Cambridge, England. 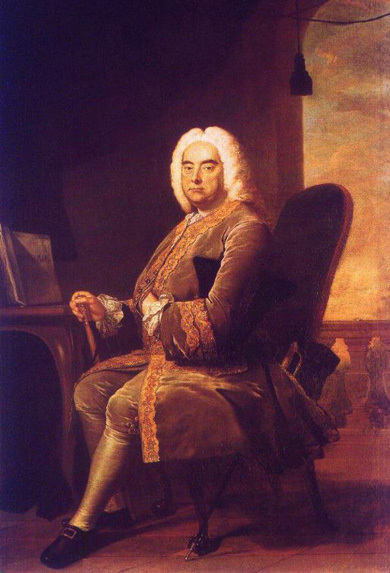 This oil painting on canvas, entitled George Frideric Handel, was created in 1756 by Thomas Hudson, 1756. The painting was purchased with funds from the Handel Appeal Fund and Her Majesty's Government in 1968. It is now located in the National Portrait Gallery, London. 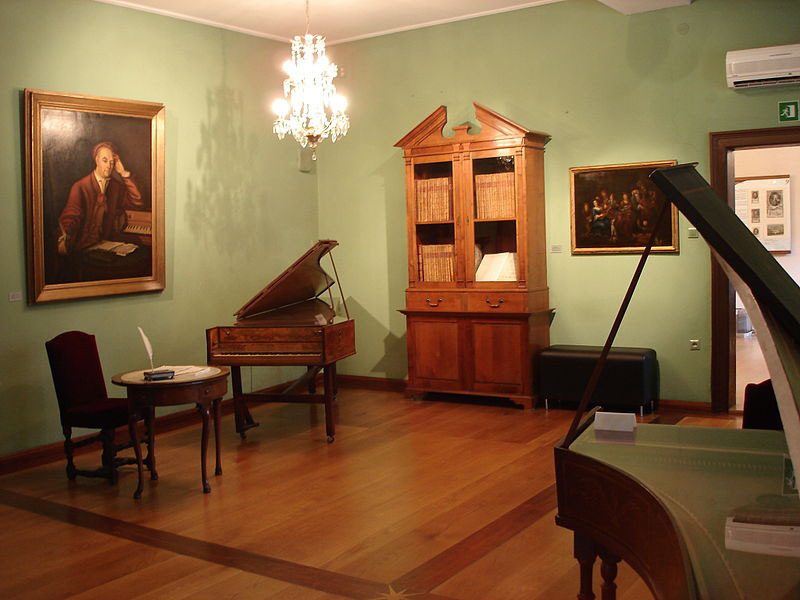 Interior view of Händelhaus (Handel House), Halle, Germany. Handel was born in this house in 1685 and lived there until he left Halle in 1703. A page of "Worthy is the Lamb", the final chorus of oratorio, Messiah, by Handel. 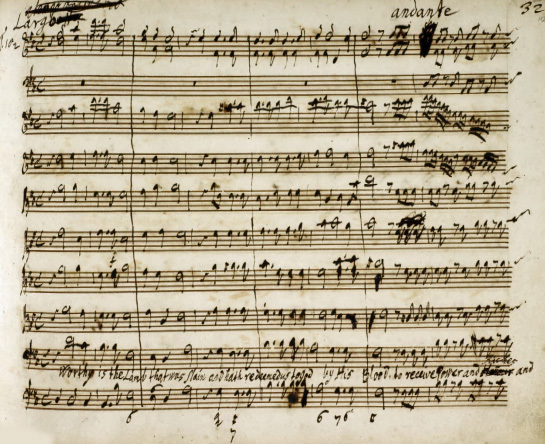 This is a view of Handel's autograph score (music score written in the composer's own hand). It is dated 1741. The above-mentioned score is held by the British Library, London, England. 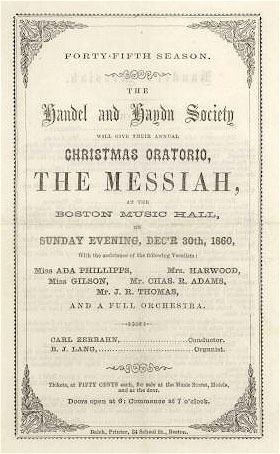 A broadside (poster) for a Boston, Massachusetts, performance of Handel's Messiah, in 1860.
at the Boston Music Hall, on Sunday evening, Dec'r 30th, 1860". 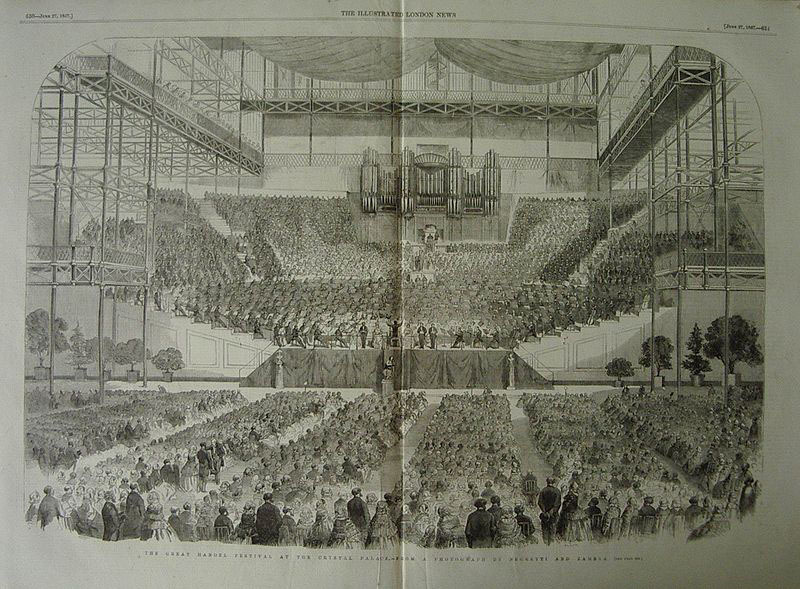 The Great Handel Festival at the Crystal Palace, London, England, in 1857. Engraving of a photograph by Negretti and Zambra. Source: The Illustrated London News, 27 July 1857. 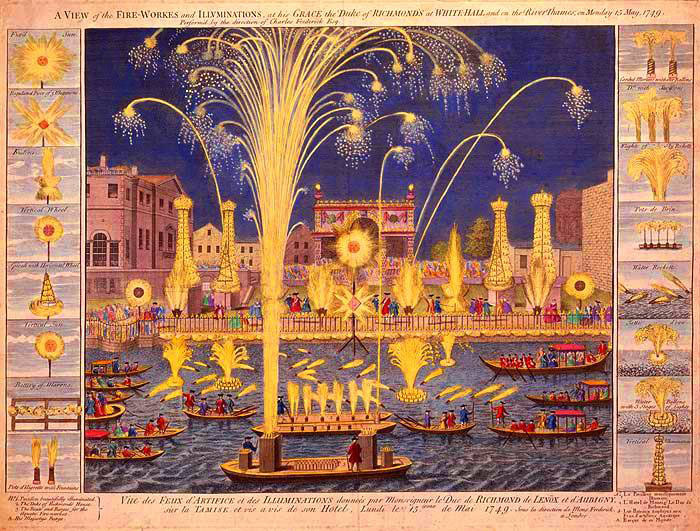 A hand-colored etching showing the Royal Fire Works and Illuminations in Whitehall, London, and on the River Thames on Monday 15 May 1749. Handel composed his Music for the Royal Fireworks for this event. The fireworks and Handel's music were viewed by King George II and were to celebrate the signing of the Treaty at Aix la Chapelle in 1748 marking the end of the War of Austrian Succession. Unfortunately, during the display, an accident occured which set fire to several thousand fireworks and killed three spectators. The text at the top of the etching reads: "A VIEW of the FIRE-WORKES and ILLUMINATIONS at his GRACE the Duke of RICHMOND'S at WHITEHALL and on the River Thames on Monday 15 May 1749. Performed by the direction of Charles Fredrick Esq.". 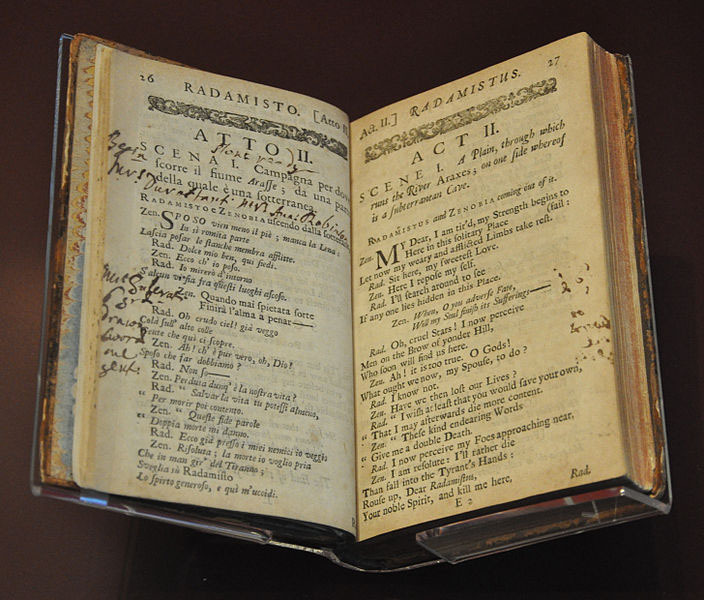 A prompt book for Handel's opera, Radamisto, which was performed at the King's Theatre, London, in 1720. Handwritten instructions for the actors appear on the shown pages. This is one of the earliest prompt books still in existence. This prompt book is currently held by the Victoria and Albert Museum, London. 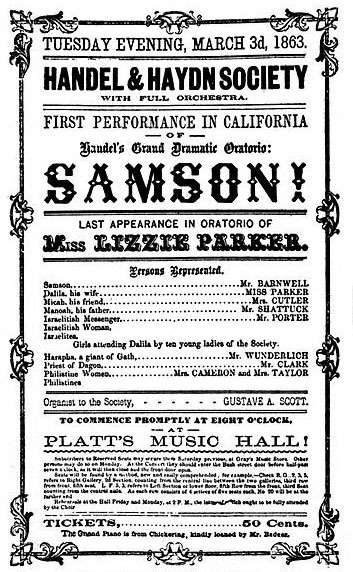 An advertisement for the perfomance of Handel's oratorio, Samson, by the "Handel and Haydn Society with Full Orchestra", at Platt's Music Hall, San Francisco, California on March 3, 1863. 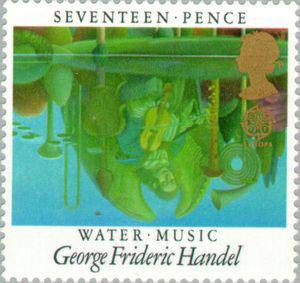 Handel's Water Music, suggested by the reflection of 18th century musicians and their instruments in still waters, is here depicted by a postage stamp issued by Great Britain in 1985. 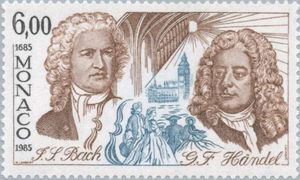 Johann Sebastian Bach and George Frideric Handel, two mightly classical composers who were born in the same year (1685), are here depicted (against the backdrop of the world they lived in) on this stamp issued by Monaco in 1985. This stamp commemorates the 300th anniversary of the year of their birth. Note: This picture gallery page includes drawings, paintings, photos and images of George Frideric Handel, his music, activities, friends and family, and the various places where the composer lived and wrote.